Paul Brady is a hugely successful singer-songwriter who has written in many different styles including folk, rock and pop. His songs have been covered by world stars such as Tina Turner, Santana and Dave Edmunds. 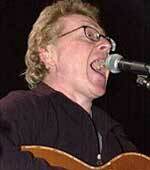 He is also a former member of traditional folk legends, Planxty. Brady was born in Strabane, County Tyrone, Northern Ireland in 1947. He started playing the piano when he was six, and the guitar when he was 11. His early heroes were The Ventures, The Shadows and Chuck Berry. He spent hours learning to play all their songs. He went to St Columb’s College in Derry and by the age of 16 he was playing piano in a hotel in Bundoran, Donegal. He went to University College Dublin in 1964. While he was there he performed in a number of RnB groups including The Inmates, The Kult, Rootzgroup and Rockhouse. While he was at University College, he noticed that traditional Irish music was enjoying a huge surge in popularity and began to focus on it more. In 1967, he replaced Michael Johnston in the popular Irish folk band, The Johnstons. The Johnstons had only limited success but it was a good experience for Brady. The band moved to London in 1969 and then to New York in 1972 in an attempt to win more fans. While in New York, Brady came across the song with which he was to be most closely associated with for the next 30 years, Arthur McBride. His stunning performance of this little known Irish traditional folk song helped to establish him as a virtuoso musician of real standing. 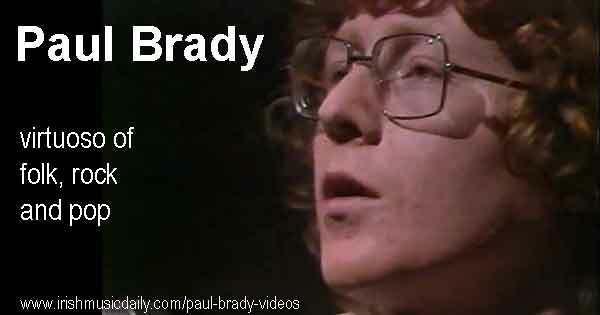 After a couple of years in New York, Brady went home to Ireland and replaced Christy Moore in Planxty. Despite Moore’s departure, Planxty were still bursting with talent and Brady found himself in good company with Dónal Lunny, Liam O’Flynn and Andy Irvine as his new musical partners. During a break from touring with Planxty, Brady briefly headed back to New York in 1975. He played guitar on three albums for Shanachie Records. The albums were for Irish fiddlers, Paddy Reynolds, Andy McGann and John Vesey. Planxty split in 1976 and Brady formed a duo with Irvine. They released an album, Andy Irvine and Paul Brady, in 1976. It was well received by music critics and over the next few years Brady started to gain a following and a reputation for being one of the best interpreters of traditional folk songs in Ireland. He also recorded another album for Shanachie Records with Irish fiddler, Tommy Peoples in 1976. In 1978, Brady released Welcome Here Kind Stranger, his debut solo album. It won the Folk Album of the Year award by Melody Maker music magazine. After this landmark album, Brady wanted to expand beyond folk music and move more towards pop and rock.